Benares, also known as Varanasi, is the holiest city in India and one of the oldest living cities of the world. It is built on the banks of the sacred river Ganges – a place of pilgrimage and home to Shiva, the volatile and compassionate god who is known as the destroyer of worlds. It is in Benares where one can obtain “moksha,” when the soul is freed from the cycle of reincarnation through birth and death. Hindus bring their dead to this city for cremation on the banks, and spread the ashes into the river. There are even hostels where the elderly can come to die. As a geriatrician I became interested in these customs, and traveled to Benares to learn and observe. On the banks of the Ganges I unexpectedly found a celebration of old age. To get to the river you need to wind through ancient alleys only a few feet wide, lined with beggars and shared with sacred cows that wander freely. Along the banks are Ghats, or large sets of stairs that lead to the water. 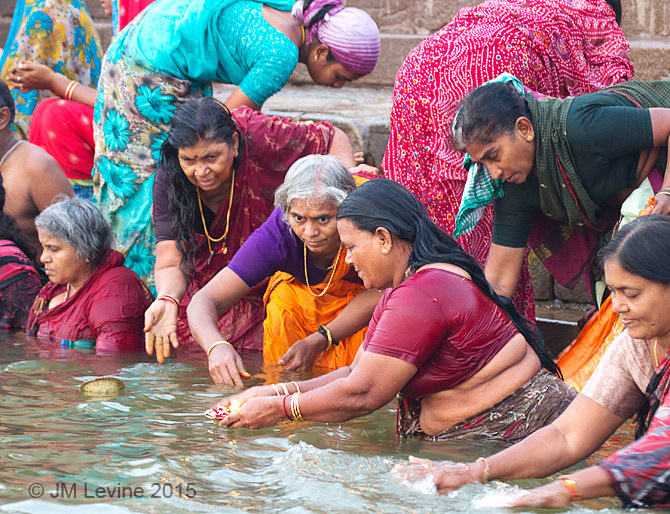 The Ghats are where people gather to bathe, pray, socialize, and do laundry. There are more than 100 Ghats along the Gangese River in Benares. Each has its own symbolism and special atmosphere, but the air in all of them is charged with spirituality and scented with incense. 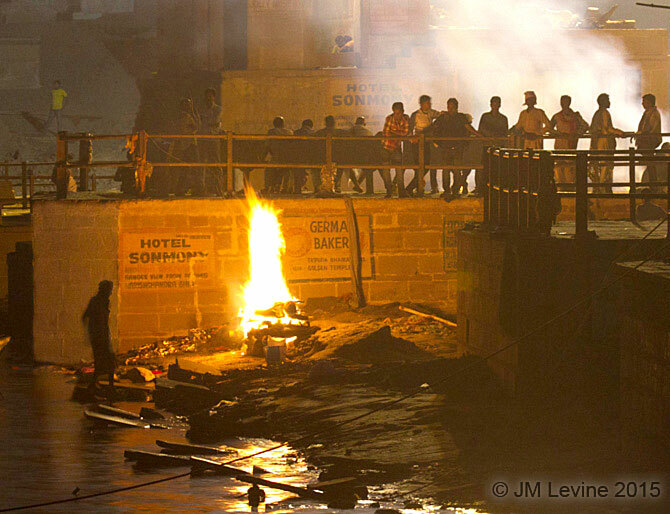 Then there are the Burning Ghats – places where families bring their dead for cremation. The body is draped in a saffron colored robe and garlands of flowers and carried on a litter to a platform on the bank, then covered with wood imported from other parts of India. On the roads into the city I saw trucks bearing dead trees and bodies strapped to roofs of cars, all destined for the Burning Ghats along the Gangese. The Burning Ghats are serious places where photography is frowned upon, so I found a comfortable spot some distance away and set up my telephoto lens. This was fine with me because the acrid smoke burned my eyes and made the air difficult to breathe. I spent hours watching and taking notes, and when night fell the fire and smoke took on a supernatural, unearthly aura. As the time passed I noticed occasional cheers rising from the direction where the cremations were taking place. The cheers were joyful and triumphant, sometimes accompanied by what sounded like pounding drums. The sounds rose quickly into the night sky then faded away. This struck me as curious and unreal, coming from a location where funerals were taking place. It happened again and again, and finally I turned to my guide and asked him about it. “When a very old person goes, we celebrate and cheer for a life well lived,” he told me. The glow and smoke from the fires suddenly took on new meaning for me with this brief but unexpected celebration of old age. 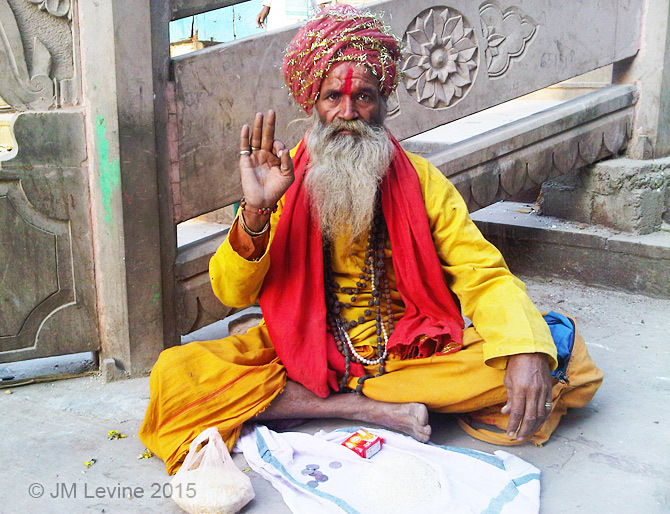 Dr. Jeff Levine’s photography exhibit entitled “An International Celebration of Aging” will be at the University of Michigan Medical Center as part of their Gifts of Art Program from June to August, 2015. Follow him on Instagram @jlevinemd.